Cooling tower motors are specially designed flange mounted motors in totally enclosed construction to suit air conditioning & refrigeration industries. They are provided with special long shaft construction with external threaded end to directly mount the fan blades. This also helps in the better cooling of the motor. 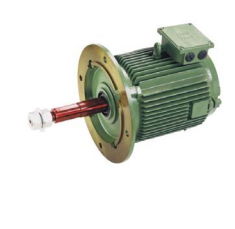 Motors are compact in design & less in weight to facilitate easy maintenance. They are available as standard catalogue designs or as custom built. Ins. class : Class F with temp. rise limited to class B.